Great coaching skills can be hard to come by. Whether it’s on a ball field or in a one-on-one situation with a colleague, there are certain abilities that are needed to make a coach successful. The Rev. Dr. Laurie Ferguson addresses those assembled for the Synod of the Trinity COM-CPM Gathering in State College in mid-November. The Rev. Dr. Laurie Ferguson shared her insights on being a coach during the Synod of the Trinity’s annual Committee on Ministry-Committee on Preparation for Ministry (COM-CPM) Gathering at the Penn Stater Hotel Conference Center in State College, PA, in mid-November. Laurie, a Presbyterian minister from Hudson River Presbytery in southern New York who works as a coach, consultant and psychologist with pastoral leaders, believes that anyone can acquire the skills to be a good coach. “Coaching skills are easy to learn, harder to practice but have a lot of potential for the work in COM and CPM,” she said. Laurie spent two days training those who had gathered with coaching methods so that those leaders can use the skills to complement what they already employ in their work. For Laurie, the importance of coaching cannot be understated. “I think coaching skills can be game-changers,” she said. “I think they can help people really attend to where the seeds are blossoming. 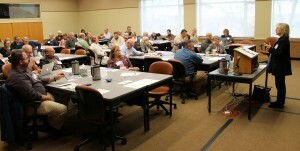 In an exercise with the Rev. David Oyler, the General Presbyter for the Presbytery of Lake Erie, Laurie demonstrated some important coaching skills for the nearly 50 people from around the Synod who had gathered who are involved in their COM or CPM groups – or both – within their presbytery. In coaching David, Laurie was deliberate in asking questions back to him. 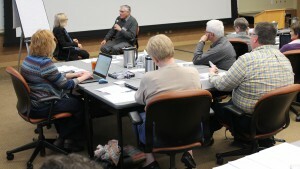 Laurie Ferguson and David Oyler participate in a coaching exercise during the Synod’s COM-CPM Gathering. Listening is also a key component of coaching, Laurie says. She stressed that each person needs to have their own listening style, and quoted Edgar Schein’s three kinds of listening as self-oriented, content-empathetic and person-empathetic. Laurie said despite having plenty of tools to be a good coach, there are some stumbling blocks that can derail a coaching session. According to Laurie, coaching is not therapy/counseling, consulting or mentoring and does not include spiritual direction or pastoral care. Consultants normally solve problems and mentors often share their own experiences, making a coach a different kind of go-to person for people seeking help. Laurie’s objective during the two-day gathering was two-fold. Because each situation is different, coaching may not be the answer for every instance.